PT Bentoel International Investama Tbk - Bentoel Group (IDX:RMBA) or most commonly known as "Bentoel" is a leading tobacco company headquartered in Malang East Java. Bentoel Group has strong business competencies in the field of integrated tobacco industry. Its business include manufacturing, marketing and selling of a diverse range of cigarette and kretek products. With 7% market shares in the Indonesian tobacco market, Bentoel Group is recognized as the fourth largest tobacco producers in Indonesia. 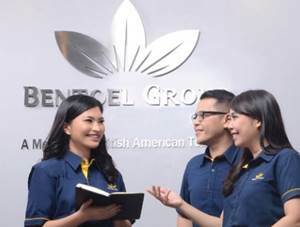 Bentoel Group is a local member of British American Tobacco Group (BAT Group), the second largest quoted tobacco group in the world. As per January 2017, BAT Group through British American Tobacco (2009 PCA) Limited holds 92.48% shares in Bentoel Group. The rest is owned by UBS AG London amounted to 7.29% and 0.23% by public. Bentoel Group now has 5 key subsidiary companies, namely PT Bentoel Prima, PT Bentoel Distribusi Utama, PT Cipta Pesona Bintang, PT Java Tobacco and PT Pantura Tobacco. According to PT Bentoel International Investama Tbk Annual Report 2016 as quoted by JobsCDC.com, Bentoel Group booked positive growth in 2016. Net revenue in 2016 grew by 14.4% to Rp 19.2 trillion from Rp 16,8 trillion in 2015. Referring to its annual report, Bentoel Group managed to record total gross profit of Rp 2.1 trillion in 2016. This number is up 23.7% from Rp 1.7 trillion in the previous year. As of the end of December 2016, Bentoel Group's total assets amounted to Rp 13.5 trillion, up 6.4% from Rp 12.7 trillion at the end of December 2015. Bachelor degree from a reputable university, majoring in Finance/ Management/ Accounting. Holds around 1-3 years of total working experience, preferably in cost accounting / Finance analyst. Preferably have previous experience in Manufacturing/Production/Operation Finance. Preferably have experience with ERP system especially SAP. Detail oriented and familiar with complex excel spread sheet. Good communication skill in English and Bahasa Indonesia (high written and spoken proficiency). Have a good presentation skill, proactively and have a passion to learn something new. Able to lead and/or coordinate people from cross department. Proactive to challenge or give idea to line manager even senior manager. Able to understand and analyze complex subjects become a simple reports/output. Able to manage multiple task and being able to perform under tight deadlines. JobsCDC.com now available on android device. Download now on Google Play here. Please be aware of recruitment fraud. The entire stage of this selection process is free of charge. Bentoel Group - Commercial Finance Analyst Operations BAT Group January 2018 will never ask for fees or upfront payments for any purposes during the recruitment process such as transportation and accommodation.